Cloudy with periods of light rain. Thunder possible. High near 65F. Winds light and variable. 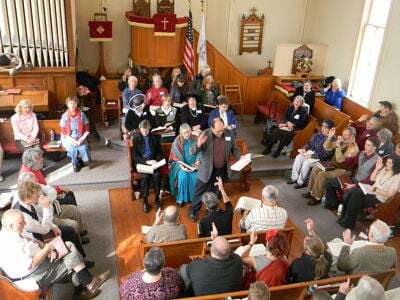 Chance of rain 70%..
For the Sacred Harp singing convention, the pews at historic St. John's UCC in Pinckney are rearranged into a hollow square, the preferred seating arrangement for shape note singing. The leader stands in the center and keeps time with his arm, while many singers do likewise. This view is from the balcony. In shape-note singing, the music is written in standard notation, except that the notes have four different shapes — triangle (fa), oval (sol), rectangle (la) and diamond (mi) — corresponding to the correct syllable. Photo by Cindy Gladden. Sunday services are no longer held at the historic St. John’s Church in Warren County, but music there continues. For the 23rd consecutive year, St. John’s will be the location of the annual Missouri State Sacred Harp Singing Convention, now in its 34th year. 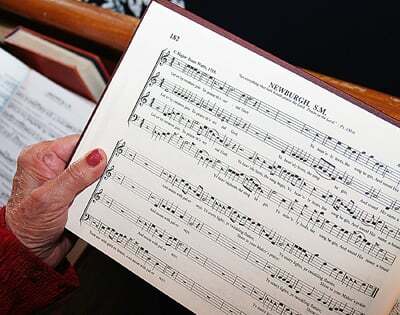 Shape Note/Sacred Harp singers will gather from many states and from Canada Saturday and Sunday, March 9 and 10, to sing from “The Sacred Harp,” first published in 1844, and from “The Missouri Harmony,” first published in 1820, revised and enlarged by Missouri area singers in 2005. There will be tune books available for purchase or for use at the singing, as well as recordings of previous Sacred Harp Singing conventions. Singers of this Early American form of singing love to come to this 1870s church because of the building’s wonderful acoustic qualities and because the building is reminiscent of the churches of Colonial New England where this style of music originated and of the rural South where it was lovingly preserved. All are invited to join in the singing — and “listeners” are also very welcome. Whether singing or listening, attendees will have the opportunity to experience “full voiced” a cappella singing consisting of dispersed harmony and haunting lyrics. There are plenty of videos of Sacred Harp singing on the internet. Although this music was first introduced to assist congregational singing in Colonial America, nowadays it has no denominational ties. Singers come from a variety of belief backgrounds — and some come with no formal religious affiliation. The appeal of this music transcends denominations and all singers feel enriched by it. Singing will be from 9:30 a.m. to 3 p.m. both days, with the customary potluck style “dinner on the grounds” at noon. In the South, these meals are often shared outside. At St. John’s, the meals will be “spread” inside the church’s fellowship building, although in fair weather it is not unusual for some to enjoy eating outside. Local attendees (both singers and listeners) bring various food dishes for all to share. When reflecting on conventions in which they have participated, Sacred Harp singers remember the music, the friendships — and the shared meals. St. John’s United Church of Christ is located approximately 12 miles west of Marthasville on Highway 94. To find the church with a GPS, set it to 38.66841 N, 91.23756 W. The map to the convention is at https://tinyurl.com/MO-SH-Conv. There is no admission, but a free-will offering will be received during the course of the convention. Contributions of food dishes for the noontime “dinner on the grounds” are also gratefully accepted. For more information, email stlfasola@gmail.com or call Paul Figura at 314-962-4870.